Average Weight	: 14 lbs. The Parson Russell Terrier was named after a clergyman named Rev. John Russell. It was used as a small-game hunting dog particularly for red fox, digging the quarry out of its den in the mid-1800s. On English hunts, the dogs needed to be long-legged enough to keep up with the hounds. The breed used to have a strong emphasis on its working ability, so the standard was very broad, allowing a wide range of accepted body types. When show breeders wanted to make the look of the dogs stricter, they decided to change the name to separate the show types from the working types. Effective April 1, 2003 the name Jack Russell Terrier was changed to Parson Russell Terrier as requested by the Jack Russell Terrier Association of America, which was changed to the Parson Russell Terrier Association of America. Some of the Parson Russell's talents include: hunting, tracking, agility and performing tricks. 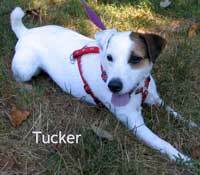 At one time the AKC called the Parson Russell Terrier a Jack Russell Terrier. However, in April of 2003, they changed the name to Parson Russell Terrier and the breeds split, forming two different breeds: the Jack Russell and the Parson Russell Terrier. The Parson's name change is in great part to a lawsuit from the JRTCA to the AKC, when the breed was first allowed registration. The former Jack Russell Terrier Association of America decided to change their Jack Russell Terriers to Parson Russell Terriers effective April 1, 2003. They changed their own name to the Parson Russell Terrier Association of America. FCI, ANKC and IKC recognize the shorts as Jack Russell Terriers and the UKC recognized the shorts as Russell Terriers. The Parsons are the long-legged Jack Russell Terriers named officially Parson Russell Terriers. The Jack Russell Terrier and the Russell Terrier are the same breed, but are entirely a separate breed from the Parson Russell Terrier. In England, the Jack Russell and the Parson Russell have always been two distinct breeds. The Jack Russell is usually smaller and is bred to catch rats. The Parson works with the hounds. •	Feisty & Energetic indoors & outdoors ~ bouncy/great jumpers. •	Excel in dog sports, such as Flyball & Agility. •	Require vigorous exercise. Hate to be bored; if bored can become destructive. •	Good with children, but do not tolerate rough handling. •	Tenacious and courageous, playful and affectionate. •	Good with other pets, get along with horses. •	Needs to learn to understand and respect rules and boundries. The Parson Russell Terrier is a cheerful, merry, devoted and loving dog. Spirited and obedient, yet absolutely fearless. Careful and amusing, they enjoy games and playing with toys. Stable Parsons are friendly and generally kind to children. Children should be taught not to tease or hit the dog. They are intelligent, and if you let them take an inch, they can become willful and determined to take a mile. It is paramount that you are this dog’s pack leader. They need to be given rules to follow, and limitations as to what he is and is not allowed to do. Do not let this little dog fall into Small Dog Syndrome, where he believes he is pack leader to all humans. This is where varying degrees of behavior problems will arise, including, but not limited to guarding, snapping, separation anxiety and obsessive barking. They are highly trainable, able to perform impressive tricks. They have been used on TV and in the movies. However, if you do not show authority towards the dog, it can be difficult to train. This breed needs a firm, experienced trainer. Parsons that have been allowed to take over can be aggressive with other dogs. Some have killed or been killed in dog fights. Be sure to socialize the Parson. They have strong hunting instincts (stronger than your average terrier) and should not be trusted with other small animals. They like to chase and explore. Be careful not to let them off the lead unless they are very well trained. Parson Russells like to bark and dig. They tend to get restless and destructive if not kept fruitfully occupied and well exercised. Parson Russells climb, which means they can climb over a fence; they also jump. A Parson that stands 12 inches high can easily jump five feet. PRTs are not the breed for an inexperienced dog owner. With the right owner the Parson can really excel, but is not recommended for those who do not understand what it means to be a dog’s true pack leader. Parsons that are mentally stable, with all of their canine instincts met, will not display these negative behaviors. They are not traits of the Parson Russell, but rather human brought on behaviors that are a result of inefficient leadership, along with a lack of mental and physical stimulation. They will thrive with a job to do. The Parson Russell Terrier must present a lively, active and alert appearance. It should impress with its fearless and happy disposition. It should be remembered that the Parson Russell is a working terrier and should retain these instincts. Nervousness, cowardice or over-aggressiveness should be discouraged and it should always appear confident.